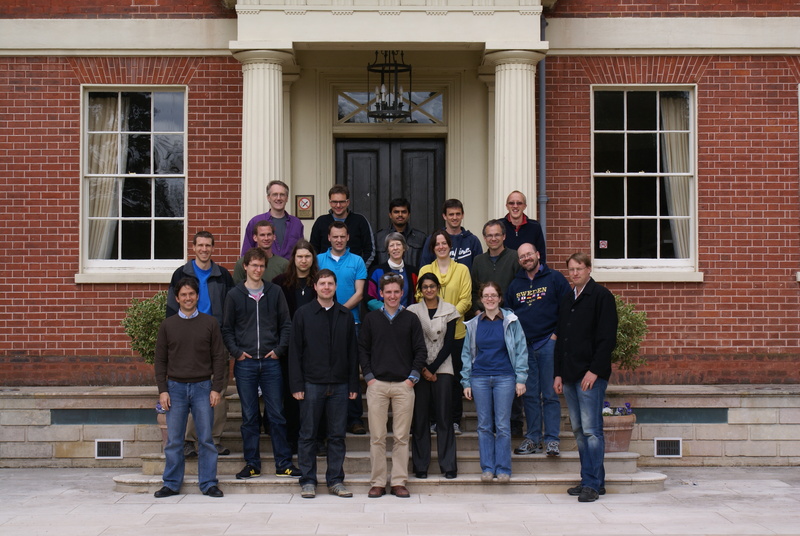 The annual Xfam consortium meeting was held on the 10-11th May 2010 and we have the photographic evidence to prove it. We spent the two days listening to talks from everyone about the latest developments. We were particularly interested to hear about new developments in HMMER3 and INFERNAL – fundamental pieces of software that Xfam rely on. Nucleotide enabled HMMER3 is in development and will be great for Rfam, hopefully replacing the current BLAST pre-filters. We are also had updates on how the HMMER software scales using multiple threading and/or MPI. We also had a number of wide ranging discussions. Erik Sonnhammer unfortunately wasn’t present this time so the usual discussion on Stockholm alignment format was avoided. However, we had a fulsome discussion of Pfam family naming nomenclature. It was generally agreed that although there were rules followed for Pfam short names, no one else in the world understood them. So we will endeavour to add a new section to our documentation about it. We discussed how much information is actually required before a DUF (domain of unknown function) is renamed to something more meaningful. We were blessed because the Icelandic ash cloud didn’t intervene. But one of our number did leave their passport in a car bound for Oxford causing a delay home. We would like to thank all the members of the Pfam and Rfam consortia for coming and also to our other EBI attendees. Other friends from EBI: Sarah Hunter, Phil Jones, Craig McAnulla and Javier Herrero. Welcome to the new blog for the Xfam databases ! Xfam is our shorthand for the combination of Pfam and Rfam databases, which we note will also future-proof us, in case we add any further databases to the brand. We hope that this blog will become a useful point of reference, where our users can learn about what is going on behind the scenes at Xfam central. We will be announcing some important changes that are coming with the eagerly awaited release of HMMER 3. As well as announcing new releases of the data and website, we’ll also try to discuss our philosophy on protein/RNA domains and sequence classification. If there are other topics that you would like to hear more about, why not leave us a comment.